Michael Collins, deputy assistant CIA director and head of the agency's East Asia Mission Center, said during a security conference that classified assessments outline the agency's record on China but that China is expanding its global ambitions. Critics have said the CIA failed to properly assess major strategic developments in China as a result of "group think" that sought to play down or ignore many of Beijing's threatening activities. The Pentagon also was slow to recognize China's emergence as a major strategic competitor that is seeking to replace the United States as the leader of the international political and economic order. Asked if the CIA harbored a benign view of China that resulted in failures to accurately assess China, Collins said the matter is secret. "Can't speak to classified assessments, it just goes a long way to say you don't have all the access you think you have in terms of understanding what the intelligence community knows about this issue," Collins told the Washington Free Beacon in remarks to a security forum in Aspen, Colorado. "I will say, however, it's a very good question," he said. "But it's a larger question, about the international system and what is it that has happened in the international system, in response to China, positively or negatively over time, that I would argue has been a big factor in explaining why the ambitions of the Chinese have so expanded." Collins described the emergence of a threatening China as "a didactic evolving aspirations the Chinese have," he said. "That is, they are learning to be more coercive, learning to be more aspirational, learning to be more assertive by what they're getting away with." The journal Foreign Affairs recently published a debate titled "Did America get China wrong?" based on an article by former diplomats Kurt Campbell and Ely Ratner who called for new policies toward China based on the failure of decades of U.S. engagement policies to mitigate the China threat. Today, China's military has fielded advanced naval, ground, air, and missile forces including anti-satellites missiles and cyber attack capabilities that could allow Beijing to defeat the U.S. military in a future conflict. A recent Rand Corp. study concluded that U.S. military forces are so poorly structured the United States is in danger of losing a future war with China. During successive administrations, official U.S. government policies toward China have sought to play down the danger from China, insisting China not be viewed as a threat but as a state to be engaged through trade and diplomacy. Pro-China policies increased since the 1980s when official U.S. government statements insisted China posed little or no threat, to policies of overt support for the communist government in Beijing. For example during the administration of President George W. Bush, then-Secretary of State Condoleezza Rice once stated the U.S. government favored "a strong China." The Trump administration sharply changed course. In December, the White House National Security Strategy, in a major policy shift, declared China to be a strategic competitor. The Pentagon followed in January with a new Pentagon defense strategy that identified Beijing as a strategic threat, along with Russia. Aggressive Chinese spying and theft of technology, largely carried out unimpeded in previous years, is now a major counterintelligence priority. Last week, FBI Director Christopher Wray disclosed that Chinese spies pose the "most significant" intelligence threat to the United States. Trump has been most aggressive with the new policy toward China in the area of unfair trade practices and China's large-scale theft, by cyber and other means, of strategic American technology. The president recently set off a trade war with Beijing by imposing tariffs on Chinese goods. 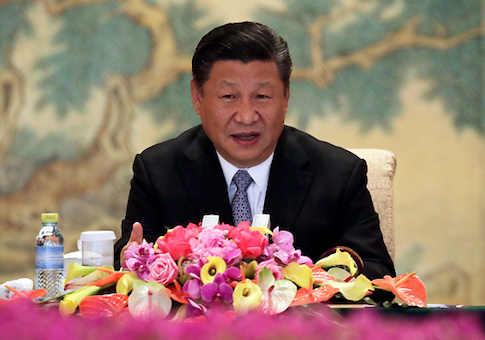 China has responded to years of conciliatory U.S. policies by seeking to alter the balance of power in its favor. Several U.S. intelligence assessments have faulted CIA analysis of China. A 2005 special U.S. intelligence assessment produced for the director of national intelligence stated that American spy agencies missed more than a dozen key Chinese military developments, including new weapons systems. Four years earlier, a panel of intelligence experts found the CIA was soft on China and suffered from an "institutional predisposition" to play down or misinterpret threats from China. The Pentagon for years also produced inaccurate assessments of China's motivation for building up its military forces. The Defense Intelligence Agency reported that the advanced weapons and forces being developed were limited and mainly meant to fight a regional conflict to retake the island of Taiwan. Today, contrary to those assessments contained in several annual China military power reports to Congress, China is now capable of destroying most strategic U.S. satellites and crippling key elements of U.S. critical infrastructure through cyber attacks. China also has expanded beyond the goal of becoming a regional power to seeking status as global military power by setting up military bases around the world. Beijing also has begun using its economic power in a global infrastructure development plan that aims to overturn the U.S.-led international order that favors democracy and free markets. "The Chinese fundamentally seek to replace the United States as the leading power in the world. We wouldn't have said that 10, 15 years ago," Collins said. Collins also warned China is engaged in influence campaigns designed to interfere in U.S. politics, media, and economics. "They are fundamentally trying to encourage those of us, the Chinese diaspora more broadly, those with whom they have influence, to think their way about governance, and not perhaps the way we would advocate, or we would prefer, the United States would prefer we think about things like the liberal international order," he said. Marcel Lettre, former undersecretary of defense of intelligence in the Obama administration and a Pentagon official in earlier administrations, acknowledged that intelligence agencies did not always provide accurate assessments of China. China, but I don't think we're too late." Lettre, appearing at the same conference with Collins, said the Pentagon for many years has "always focused on how to understand the changing nature of the China threat, and how that paces our need for innovation." Lettre, however, noted that Air Force Gen. Paul Selva, vice chairman of the Joint Chiefs of Staff, warned last month that the United States is in danger of losing technological superiority to China by 2020. "And so we have to really redouble our efforts to understand what the nature of that pacing threat is in the security context, and put our best and brightest energies towards ensuring our advantages don't erode, and that we can actually outpace the Chinese in key areas of strategic interests for us," Lettre said. Collins, in unusually blunt comments, said China is waging a new Cold War against the United States and stated that the threat from China comes from the Communist Party-ruled system. "By their own terms, and what [Chinese President] Xi Jinping enunciates, I would argue, by definition … what they're waging against us is fundamentally a cold war," Collins said. "A cold war not like we saw during the Cold War, but a cold war by definition. A country that exploits all avenues of power, licit and illicit, public and private, economic, military, to undermine the standing of your rival relative to your own standing, without resorting to conflict." Collins said it is important to distinguish between China as a country and the Communist Party of China (CCP) that has ruled since 1949 often with disastrous results, including the estimated deaths of some 60 million Chinese through economic mismanagement and an effort to turn China into an ideal communist state. "When we objectively look at the threat from China, we objectively do not see China itself, nor the rise of China, nor Chinese people themselves as the threat, necessarily," Collins said. "What we worry about is the CCP direction and what the Communist Party of China is attempting to achieve and in increasingly coercive ways," he added. Collins said the Chinese exploited U.S. and international attention to countering terrorism after the September 11 terror attacks. "The Chinese drove through that decade to especially expanding where they are," Collins said. "So that's a long way of saying there's things that happen in the international system, things that happen in governments that I'm certainly not responsible for objectively analyzing, that help to explain I think to some degree the speed and expanse with which the Chinese have gotten to where they are today." Susan Thornton, acting assistant secretary of state for East Asian and Pacific Affairs, told the conference that she is confident of the American ability to compete with China. "I think the Chinese are very good at taking advantage of asymmetric advantages," she said. China took advantage of the U.S. focus on the Middle East and the 2008 financial crisis. "And I think we have to get back to what we do well," she said. "Our soft power is incredibly more powerful than the Chinese soft power. They don't really have that same kind of attractiveness that the U.S. system has, and it's because I think our partners around the world know that we stand by them and that we aren't going to try to impose our interests or our will on them. That we'll work together with them."